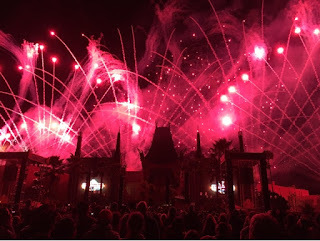 Hollywood Studios now has a nightly fireworks show called Symphony in the Stars: A Galactic Spectacular. I saw it for the first time last night. It is truly one of the best fireworks shows I've ever seen. Set to Star Wars music, the power and energy of this production never lets up. This shot, with the emphasis on red, was during an "Empire" segment. Star Tours at Hollywood Studios has a great queue line. It includes a full size StarSpeeder as well as a handful of droids. 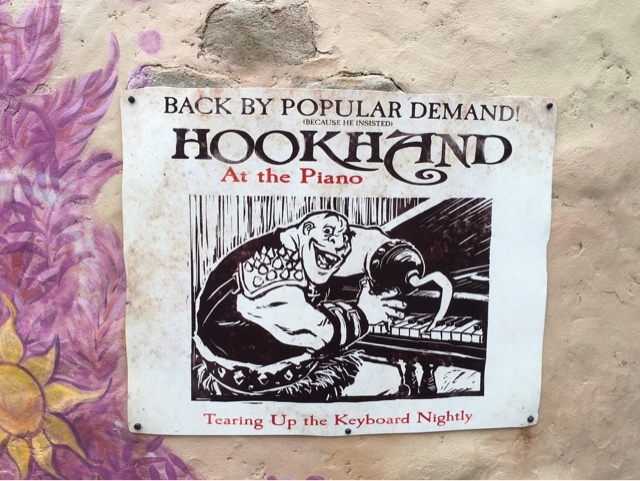 This one can be found on the left side, just prior to the second FastPass touch point. 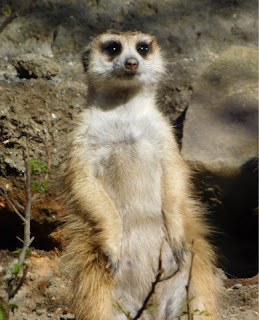 I have posted several pictures of different animals this week from Pangani Forest Trail at Animal Kingdom. However, the "main attraction" of this area is the gorillas. 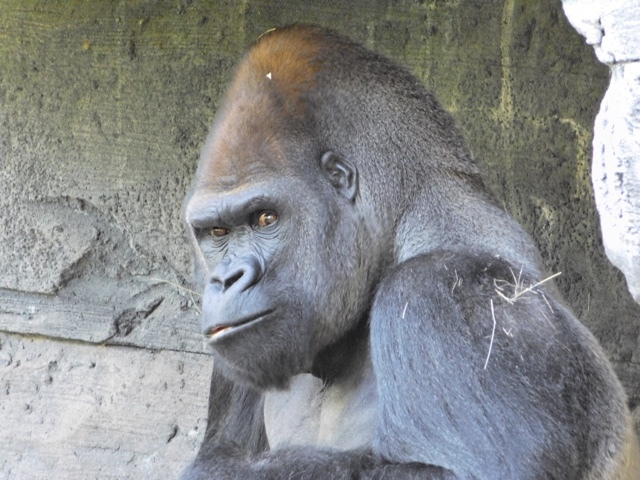 This is a male silverback relaxing in his enclosure. 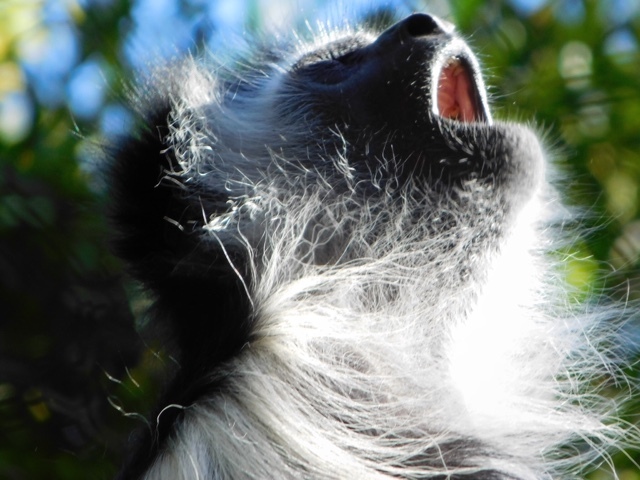 I took this fun shot of a colobus monkey a few days ago in Animal Kingdom. This is one of the first exhibits guests see on the Pangani Forest Trail. I apparently hit the shutter button just as this guy was yawning. 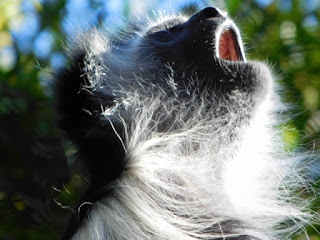 Although Pangani Forest Trail at Animal Kingdom is known for gorillas, there are some other interesting animals there as well. Here is a meerkat on lookout duty. There is always at least one that is constantly scanning the area for possible predators. Although there isn't any danger in this protected environment, they are instinctually "nervous" animals. 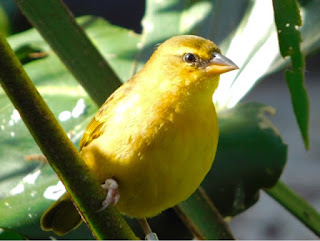 This is a Taveta Golden Weaver from the Pangani Forest Trail in Animal Kingdom. There are 140 of these birds in this aviary, and each one is identified twice per day. This species builds their nests upside down to protect themselves from predators. Since my birthday is coming up, I decided to theme this week to my favorite park, Animal Kingdom. 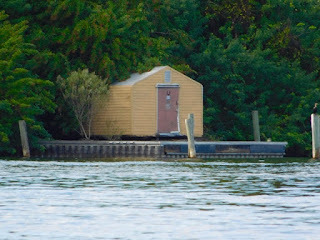 I spent some time there today, and took a bunch of photos with my new Nikon camera, which has a powerful telephoto lens. 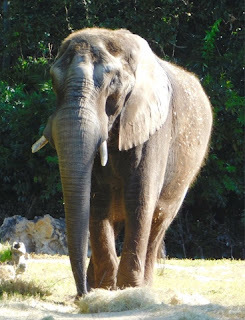 This first shot is an elephant from Kilimanjaro Safaris. 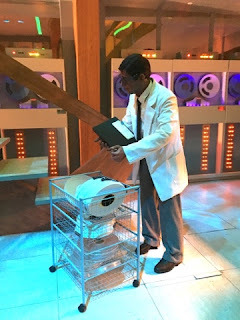 Today, I was able to take several good shots inside of Spaceship Earth, including this one from the computer room. This is normally hard to do because of the low light levels and motion. However, the vehicles slowed down a few times, allowing me to get some clear photos. 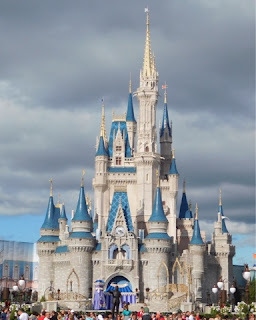 One of my favorite attractions at Walt Disney World is Walt Disney: One Man's Dream. This historical walk through Walt's life and achievements ends with a brief movie about the man. 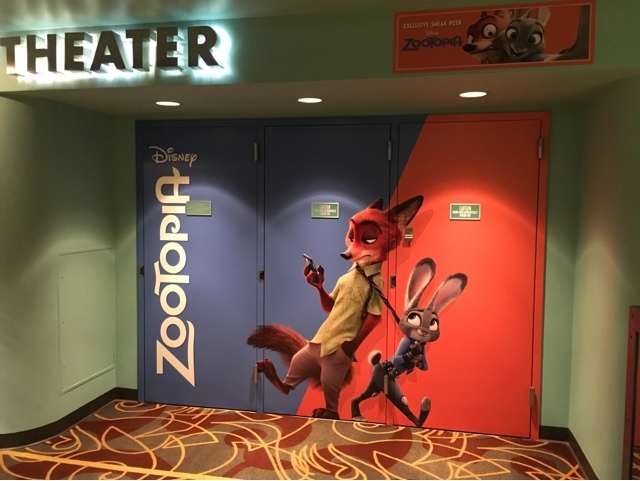 However, of recent times, Disney has been using the Walt Disney Theater to promote its newest movies. As much as I miss seeing the "Walt" movie, I certainly understand why they use this space for previews. Today, I caught the most recent of these for the upcoming movie, Zootopia. One of the things that makes Epcot great is the live entertainment. 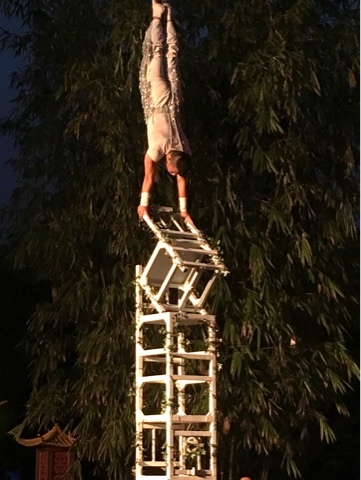 The Jeweled Dragon Acrobats are an amazing group of talented young people who perform many times each day outside of the China pavilion. This acrobat was about 15 feet up on top of 6 chairs when I took this shot last night. 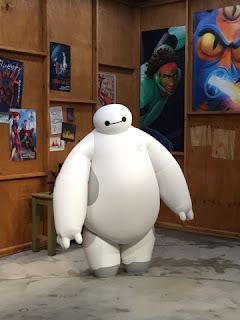 Up until last summer, guests at Hollywood Studios were able to meet Baymax and Hiro from the movie Big Hero 6. 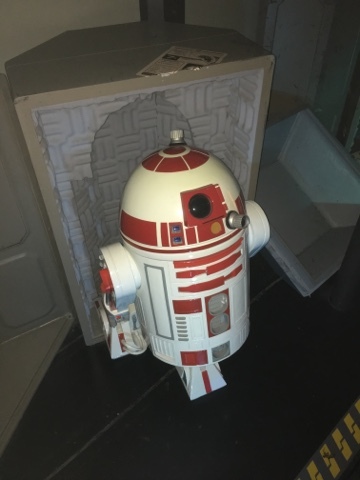 That meet-and-greet was removed to make way for the new Star Wars - Launch Bay attraction. However, Baymax recently showed up in Epcot's Innoventions West to greet guests once again. He is in the area across the breezeway from the "Character Spot." Today was another cool, crisp day in Central Florida. 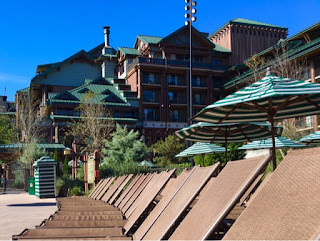 I spent some time at Wilderness Lodge this morning. You can see that the pool area is very quiet when the temps are in the 50s! 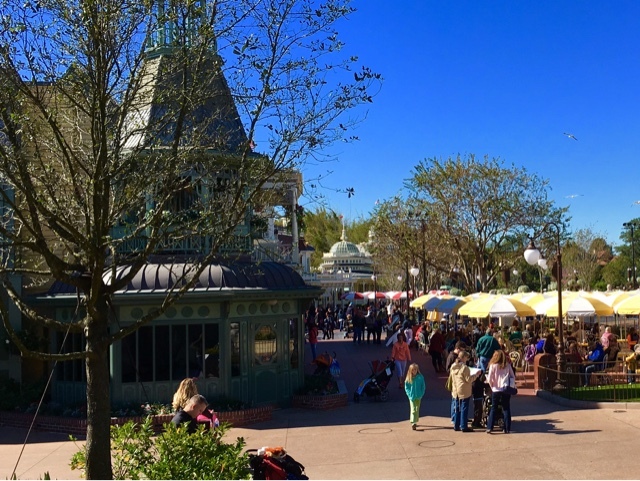 I took this shot toward Main Street from the top level of Tomorrowland Terrace today. You can see The Plaza restaurant on the left and Crystal Palace in the distance. The air was crisp and clear today and good for photos. 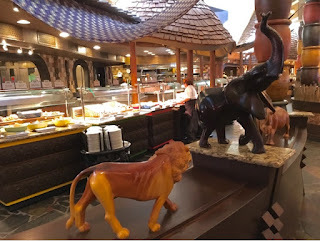 Today, we had the chance to eat at Boma, at Animal Kingdom Lodge, for the first time. We enjoyed breakfast there, as we celebrated my wife's birthday. It is an excellent buffet with a huge number of food choices. Although it features African inspired dishes, there are plenty of traditional "brunch" items as well. 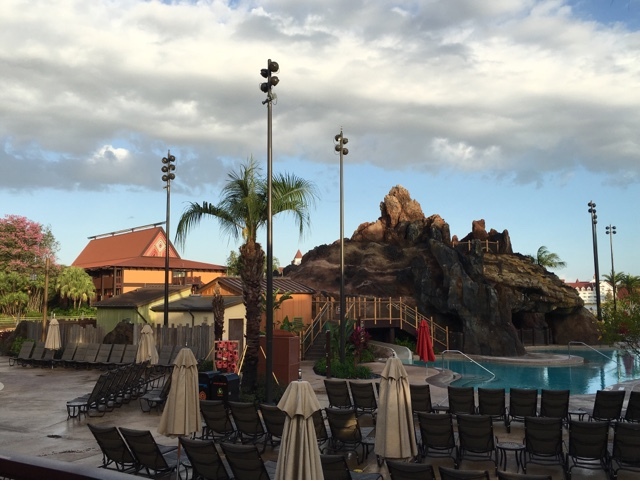 The Polynesian Village Resort has undergone some major refurbishments over the last few years. One of the updates was the Volcano Pool and the surrounding area. I took this shot this morning, just before meeting up with my tour guests. 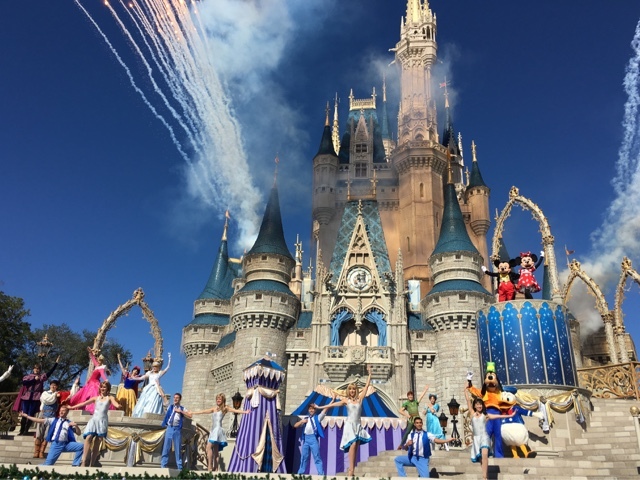 The Dream Along with Mickey show takes place on the castle stage many times each day. It features a bunch of the popular Disney characters and princesses. I took this shot during the finale of a show earlier this week. 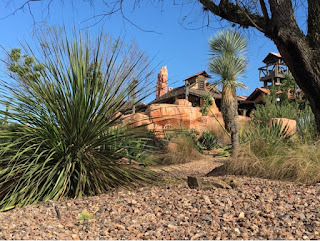 I took this shot today from the cell phone charging area in Fantasyland. This is the building that is home to Peter Pan's Flight. It is on your left when heading into Liberty Square. 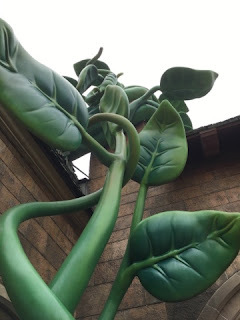 This beanstalk can be found in Fantasyland, on the side of Sir Mickey's. That gift shop is partially themed to the 1947 movie "Mickey and the Beanstalk." At this angle, it almost looks like it is extending high into the sky. Pluto's Toy Palace is on Hollywood Boulevard at Hollywood Studios. 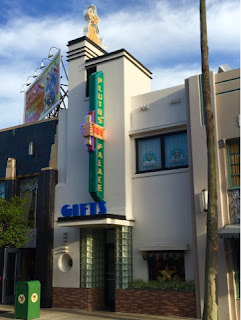 This spot is actually part of the large gift shop known as Mickey's of Hollywood. 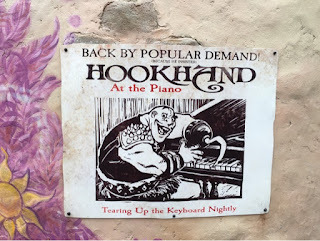 The entire area is themed to the 1930s. I took this shot yesterday afternoon. Enchanted Tales with Belle has some of the most advanced technology of any Magic Kingdom attraction. 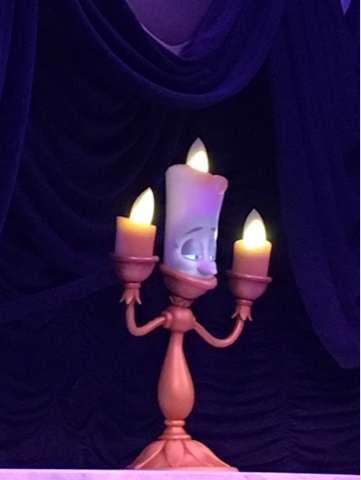 The Lumiere figure is an incredible animatronic. I took this shot while enjoying the experience with family yesterday. 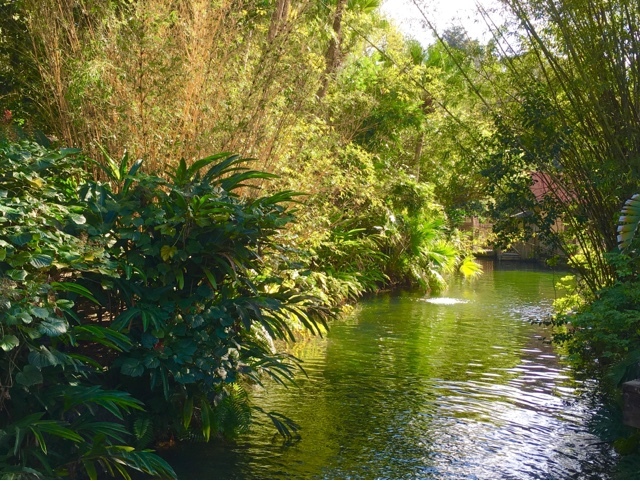 This river runs through the south side of Adventureland. I was standing between the Swiss Family Treehouse and Jungle Cruise when I took this shot a few days ago. From the serenity of this photo, it is almost hard to believe that there were thousands of people roaming the pathways of the Magic Kingdom so closeby. 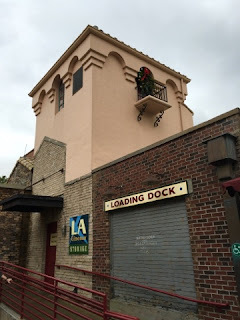 In continuing with yesterday's restroom theme, here is a shot of a restroom area in Hollywood Studios. It is located on Sunset Boulevard, and certainly keeps with the Hollywood theme. I took this shot a few days ago. Walt Disney World is known for incorporating themes into their attractions, restaurants, and hotels. However, in this case, they have done an amazing job at theming a restroom complex. 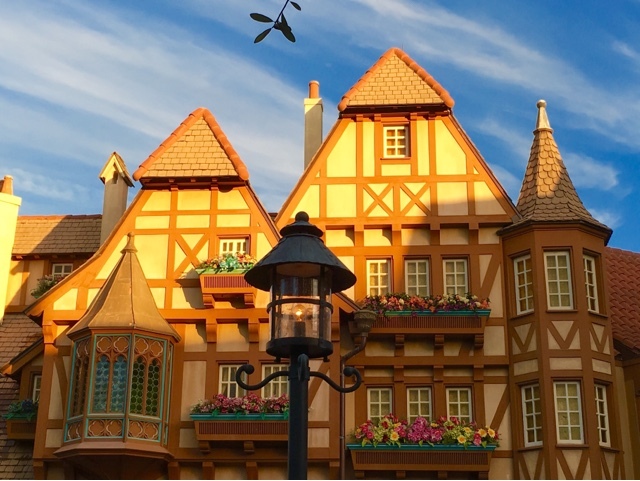 There is much detail to be found inside and outside of these "Tangled" restrooms in Fantasyland. This poster is hanging on the outside of the building. 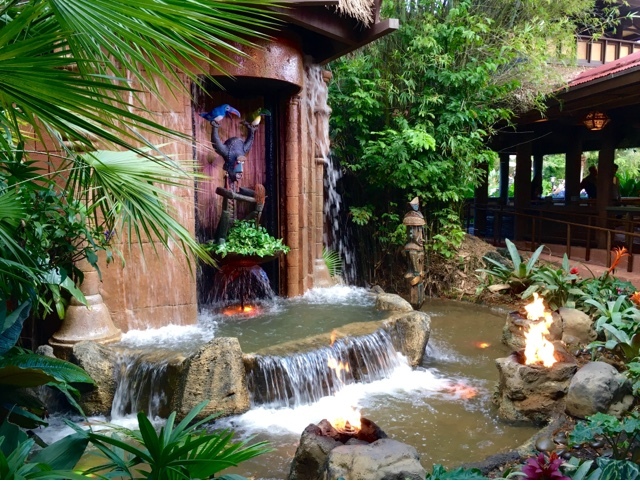 Walt Disney's Enchanted Tiki Room is a classic attraction with historical significance. The Disneyland version contained the very first audio-animatronic figure. I took this shot of the outdoor pre-show area a few days ago. 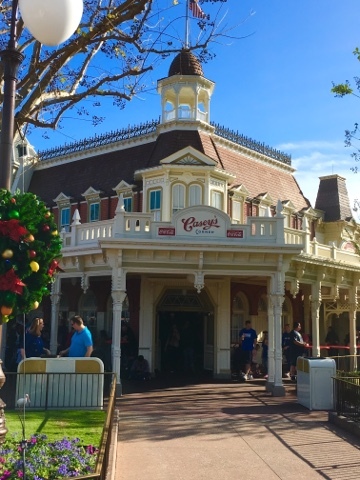 Most of the photos I have of Casey's at the Magic Kingdom are from Main Street, USA. Today, I took a shot of the other entrance, on the Crystal Palace side. This door takes you into the dining area of the restaurant. This is also a good way to enter the Emporium, as well as to bypass Main Street when you are heading for the park exit. 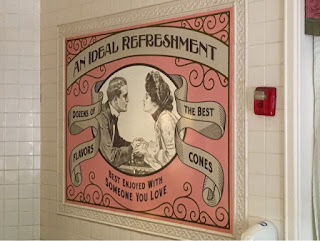 The Plaza Ice Cream Parlor is a great spot for dessert on Main Street, USA. 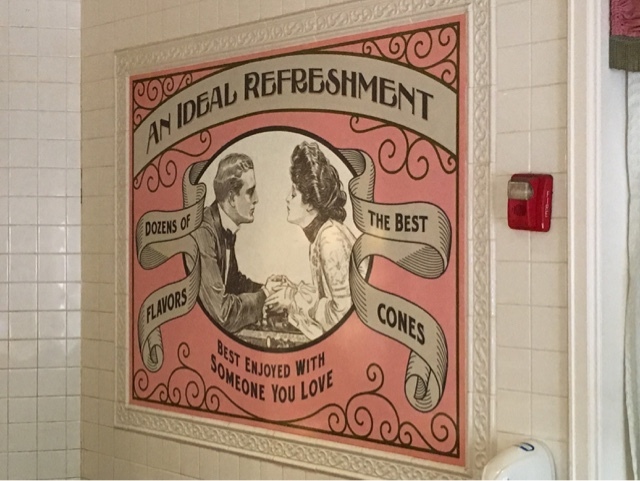 Disney uses a "smellitzer" to pump the waffle cone smell into the air, which draws guests in by the dozens. This picture on the far right wall is an example of the early 1900s time period depicted by this shop. One of the things I love about Disney is how well they create landscapes to fit the theming of each area of the parks. I took this shot near Big Thunder Mountain today. You can see that they have "built" a desert right in the middle of Central Florida. With the inevitable success of Star Wars - The Force Awakens, there has been a merchandise blitz like we've never seen for any previous movie. 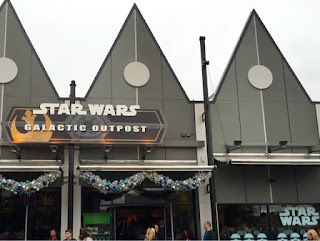 There is Star Wars merchandise to be found in just about every retail store on Disney property. In addition, there are now a handful of dedicated Star Wars locations. Recently, Disney gave D-Street at Disney Springs a makeover, and it has been converted into the "Galactic Outpost." We had the opportunity to dine at The BOATHOUSE for the first time today. 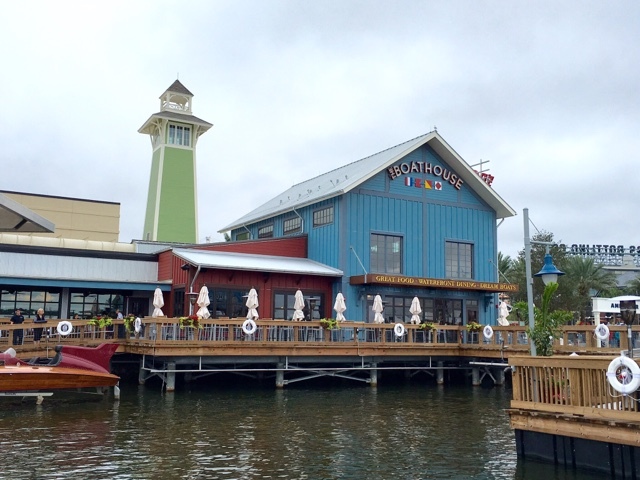 This waterside restaurant is part of the new Disney Springs makeover of Downtown Disney. The food is very good and there is a fun nautical theme. There are many antique boats docked here, as well as the ability to take a ride In an "amphicar." I'd certainly recommend this spot and look forward to dining there again in the future. Discovery Island sits deserted in the middle of Bay Lake. It was once an active wildlife park, but it has been closed since 1999, the year after Animal Kingdom opened. 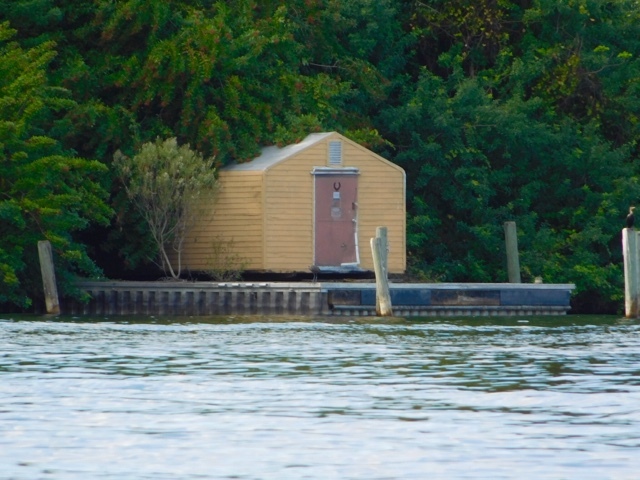 I took this shot of a shack on the island from the shore of Fort Wilderness. 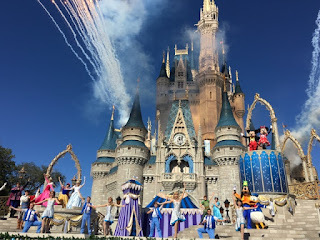 When I started Digital Disney World five years ago, I had no idea if it would last. This website continues to allow me to stop each day and write about my passion for a few minutes. I want to say a a huge thank you to everyone who has enjoyed my daily posts. To mark this occasion, I thought it was appropriate to post a recent shot of the icon of the park that started it all.